Whether you are a lifelong ballet fan or attending for the first time, the more you know about what you are going to see, the more you will enjoy it! Read on our website about the performance you are seeing. Follow Nashville Ballet on Twitter and Facebook to learn about each performance through our posts and educational bulletins. Visit our YouTube channel to watch videos of rehearsal, performances or explanations of what you will see. Check the dancer bios to get an idea of who you might be seeing or learn who is new to the company. Take time to listen to a recording of the music for the ballets you will see, and become familiar with it. Once you are in the theater, you can learn more about the performance and the performers by reading all of the information provided in the program. By visiting Nashville Ballet's information tables and displays, you can see and touch real ballet costumes, shoes, costume sketches and set models. Formal attire at the ballet, opera or symphony is no longer the custom. Today, most guests come dressed in what might best be described as "business casual." Suit jackets and ties are not required for men. However, those having an elegant "night out on the town" will come dressed for exactly that type of occasion. During the holiday season, some families will come dressed in holiday apparel. Children are welcome to attend any performance that parents deem appropriate for the child. Some of our performances are designed especially for families and children. They are appropriate for all ages and offer a perfect opportunity for children of all ages to become acquainted with ballet. Not all performances are suitable for young audiences, so we encourage parents to consider the content and time of the performance before deciding to bring a child. Any patron disrupting fellow patrons may be asked to leave the theater. Audience members are typically admitted to the theater 30 minutes prior to the start of the performance. If you are picking up or purchasing tickets at the box office, you should allow at least 30 minutes before seating begins to do so, as there may be long lines. Arriving early will give you time to get to your seat and review your program. Traffic and parking in downtown Nashville can be unpredictable, so plan to arrive early to ensure an enjoyable experience. All performances at TPAC have assigned seating, with the seat row and number listed on each ticket. Performances at The Martin Center for Nashville Ballet are general admission, unless otherwise specified. Ushers will likely guide you to seating options to maximize the seating opportunities for patrons during these performances. All Nashville Ballet performances begin promptly at their designated start times. Please check your tickets to be sure you have received the correct day and time. Plan accordingly, allowing adequate time for traffic, parking and inclement weather, so you can be in your seats before the performance. As a courtesy to both artists and patrons, latecomers will be held in the lobby and seated at the discretion of house management. Cameras and recording devices are strictly prohibited by Nashville Ballet, The Nashville Symphony and the Tennessee Performing Arts Center. Flash photography can be distracting and dangerous to the dancers. Recording the performance is a violation of copyright guidelines. Please leave this equipment at home. As a courtesy to the dancers and other audience members, please turn off all pagers and cellular phones before entering the theater. Lit cell phone screens can also be a distraction to dancers and audience members. If you plan to spend time in downtown Nashville before or after the performance, you can find a current list of restaurants, bars and coffee shops through the Nashville Downtown Partnership. Nashville Ballet performs at the James K. Polk and Andrew Jackson Theaters at the Tennessee Performing Arts Center (TPAC) in downtown Nashville and at The Martin Center for Nashville Ballet, our studio space just west of downtown Nashville, in the Sylvan Heights neighborhood. TPAC is located near numerous surface and garage parking options and also offers valet service. Street Parking – Street parking is limited and may be metered during peak times. Be sure to park in designated parking zones only. We are not responsible for any cars that are ticketed or towed. Accessible parking is located on both sides of 6th Avenue, between Deaderick Street and Charlotte Avenue during the times of TPAC performances. Accessible parking is available on the north side of 6th Avenue 24 hours, 7 days a week. On the south side of 6th Avenue, accessible parking is designated after 5:30 p.m. and all day Saturday and Sunday. Violators are subject to ticketing and towing. For performances in Andrew Jackson Hall, patrons with special needs may prefer to be dropped off on the corner of Union Street and 6th Avenue. For performances in the Polk Theater, patrons with special needs may prefer to be dropped off in front of the main entrance to TPAC in the loading zone area on Deaderick Street, near the corner of 5th Avenue. Valet service is provided at the front entrance to TPAC located on 6th Avenue, at a cost of $20. If you plan on using the valet service, please plan on arriving earlier than normal. Please note that due to downtown business hours, valet may not be available for weekday matinees. Free parking is available at The Martin Center for Nashville Ballet for performances at that location. Since Nashville Ballet shares parking with adjacent businesses, a parking attendant may be present to direct traffic to available spots during special events. Individual ticket sales are facilitated through TPAC by calling (615) 782-4040, visiting their website or by visiting the TPAC Box Office downtown. 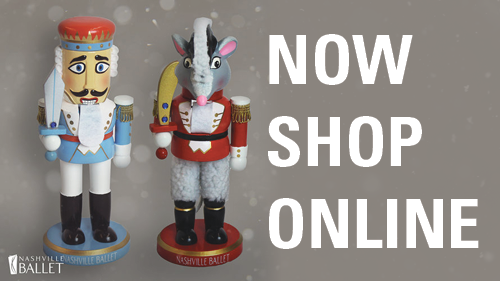 Season ticket packages and group tickets can be purchased directly from Nashville Ballet by calling (615) 297-2966 x710, ordering online or visiting The Martin Center for Nashville Ballet during business hours. Tickets are mailed to ticket buyers as long as there are seven (7) days between the date of ticket order and date of performance unless guests specify they wish the tickets to be held at the box office. Tickets may be picked up during box office hours up until the time of performance. Patrons who have lost or misplaced tickets or mixed up dates of attendance should report to the box office window where tickets can be reprinted or dates exchanged (if seating is available). Patrons may also call (615) 297-2966 x710 for assistance.